Sony KDL-37EX503 review | What Hi-Fi? 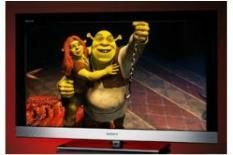 It's still early days but it seems Sony is back with a vengeance in the battle for supremacy among 2010's TV ranges. The 'EX503 range won a 32in Supertest so we have high hopes for its 37in sibling. The set is certainly up to its eyeballs in the latest functionality and features. Media streaming is one of this year's key TV trends and Sony offers Bravia Internet Video here, giving you access to a range of content once your TV is connected to your home network, the highlight of which – and the one that sets it apart from other company's offerings – is the link-up with LoveFilm. If you're a member of the service you can stream films straight to your set. Part of Sony's ‘Essential' range, at the bottom end of the price spectrum, this is a 100Hz set rather than 200Hz but still includes a Freeview HD tuner, the now-standard 1920 x 1080 screen resolution, DLNA streaming, video playback over USB and four HDMI inputs, including two on the side of the 10cm-deep set. Sony's XrossMediaBar interface makes navigating fairly easy, and the remote is one of the company's new two-sided affairs - the solitary power button is on the back of the handset. We auto-tune the digital tuner and are soon enjoying the Freeview HD images from BBC HD, ITV HD and C4 HD. Sonically it's clear and reasonably dynamic while, more crucially, the standard-definition picture is largely free of noise, displaying crisp edges, smooth motion and good detail. That smooth motion is now a real trademark of Sony's sets. It may not boast a 200Hz panel but the Motionflow 100Hz screen is clearly more than adequate with fast action, the various fantastic flying animals in Avatar rendered with unwavering edges. There's a real sense of depth and involvement to the image, too, with superbly natural and revealing skin tones helping us to become fully immersed in what we see. Colours are natural yet punchy and bright when required, while dark scenes show the Sony's happy delivering sturdy, deep black shades too. And all this at such a competitive price; see this telly before you think about buying anything else.